The early bird may have gotten the worm, but after the meal did it fly, fly home? If it did at all, the famous four-winged Anchiornis – who lived around 160 million years ago in the Jurassic – did not fly like today’s birds, concludes a molecular study of primitive feathers published Monday in the Proceedings of the National Academy of Sciences. Never mind that the creature didn’t have a breastbone like birds do, or appropriate wing shapes: Anchiornis’ feather protein was more rigid than exists in today’s birds. It could flap until the cows evolved and came home but it couldn’t take off, at least not in adulthood, paleontologists believe. Possibly the wee baby Anchiornises could get off the ground, but nobody's betting on it. Feathers consist mainly of keratin. Modern bird feathers have a form of the protein called beta-keratin, but Anchiornis had mainly a thicker, less flexible type called alpha-keratin. That rendered them less biomechanically suitable for flight, explain Dr. Yanhong Pan and colleagues at the Chinese Academy of Science. The requisite conclusion is that these early birds could flap around but not fly. 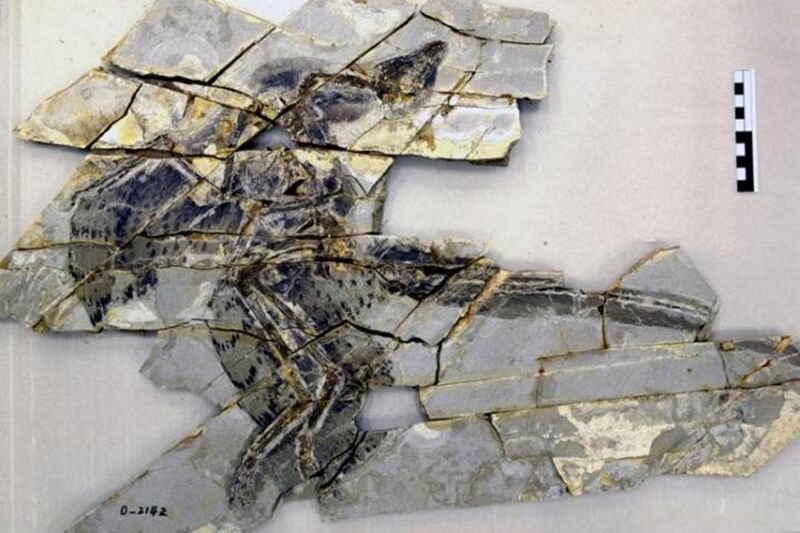 However, by the time other ancient dinosaur-birds such as Eoconfuciusornis and the fish-eating dinobird Yanornis came along in the Cretaceous (around 130 million years ago), they had evolved the flight-friendly alpha-keratin in their feathers, the team says. The primordial question is: What came first, the chicken or its feathers? The feathers, it seems. In 2014, paleontologists began to suspect that being feathered was the basal dinosaurian condition. Feathers apparently evolved for the same reason fur did: to insulate the animal and keep it warm. Flight was a subsequent development. Birds evolved from bipedal dinosaurian carnivores, but about 30 species of bipedal carnivore that did not become birdly were found to have been feathered. The turning point was when paleontologists realized that a herbivorous, non-avian dinosaur named Kulindadromeus zabaikalicus had been feathered too. That birthed the postulation that not only velociraptors, T-rexes and their ilk probably sported at least twee fluff around their ankles – so did most or all dinosaurs, at least as infants. Feathers evolved over the eons. The realization that Anchiornis’ keratin 160 million years ago was not the flight-friendly sort arose from molecular comparison of its fossilized feathers with those of a chicken. The team also looked at other fossil dinobirds. But one doesn’t need a microscope to postulate that the Anchiornis didn’t fly like a chicken. 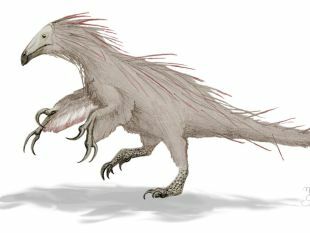 It had four wings because, unlike today’s birds, its legs also had long feathers. Those arms and legs were quite long, too. Scientists don’t suggest the lanky Anchiornis was flapping its legs too, but the feathers there would have contributed to aerial maneuvering in some fashion, if it flew. Also, chickens don’t fly, as a generality. But that’s an aberration not caused by their feathers, and with effort some can fly for short distances. One possibility is that the Anchiornis’ keratin represents an intermediate stage in the evolution of avian flight feathers. Another possibility is that it doesn’t. But the discovery that its feathers had a type of keratin not supportive of soaring through the skies may strengthen another theory: That Anchiornis’ wings were key to display – sexual display and/or aggression. Other studies, of fossil melanosomes detected in the feathers, suggest that Anchiornis was predominantly black and gray, with some white stripes, but had a reddish crown of feathers. One can almost see the tiny Anchiornis shaking its crown as it stamped around the Jurassic jungles displaying its leg feathers in search of a mate.